How do I play songs or videos continuously in RealPlayer? In RealPlayer, you can play a list of video or music files continuously without a break. You can repeat a playlist or even one track over and over. To do this, first set the player to Continuous Play, then open the Now Playing section and set up your Queue. 1. In the player, click the logo in the upper left. 2. 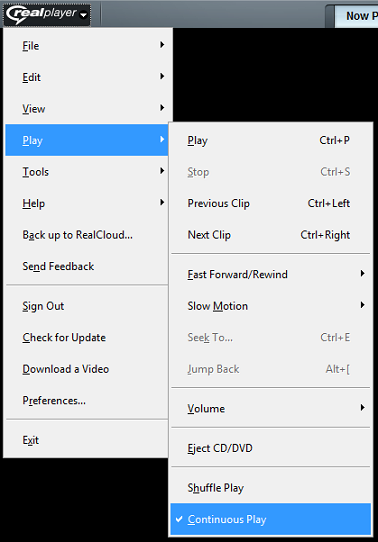 Select Play, then click Continuous Play. 2. Click the Library tab. On the bottom right side of the player, click the Queue button, showing the existing songs in rotation. 3. If you want to clear the list and start a new one, click the Clear button at the bottom. If asked "Clear all clips from Playback Queue?" click Yes. 4. Drag music or video files from the Library list in the left side window to the Queue column. To change the order the songs play in, drag and drop them within the Queue column. 5. When finished, double-click the clip at the top of the Queue column to start playing the list. RealPlayer will play through the list, then start over when finished. NOTE: To play a single video over and over, simply right-click the video in the RealPlayer Library and select Play in a loop.